The word anime is often defined as “animation from Japan.” If only it were that simple! This piece originally appeared 3/5/15. When you hear “anime,” images of large eyes, funny and colorful hair, and peculiar fashion come to mind. Look at that blue hair! In Japanese, anime is written as “アニメ” (literally, “anime”) and is short for the word “animation” (アニメーション or “animeeshon”). The rub is how the word is used, both in Japan and abroad. Shortening words is common in Japanese. If the language is able to make something shorter, you can bet that it will. So, for example, “remote control” (リモートコントロール or “rimooto kontorooru”) becomes “rimokon” (リモコン), the word “television” (テレビジョン or “terebijon”) is now just “terebi” (テレビ), and the long product name “Family Computer” (ファミリーコンピュータ or “Famirii Konpyuuta”) becomes “Famicom” (ファミコン). Even names get shortened in informal speech. “Brad Pitt,” for example, is “Burapi” (ブラピ). The language—or at least its speakers—often seem obsessed with making lingo shorter and more compact in daily conversation. Those examples are foreign loan words, but Japanese words also are contracted and shortened in a similar manner. Loan words are called “gairaigo” (外来語) in Japanese, but even though they’re borrowed, the words are absorbed into more than the lexicon. They become part of the culture and society. They’re often used to explain ideas and concepts—Japanese ideas and concepts—in a more nuanced way. While they have been born abroad, they’re linguistic immigrants, and eventually they become Japanese. Case in point, “anime.” The word itself isn’t that old. Initially, only people in the animation business used the word “animation” in Japan. The general public used different words for the Japanese cartoons that appeared in movie theaters and on television. As website Gogen explains, there was the awkward “manga eiga” (漫画映画) or “manga movie” or the equally awkward “terebi manga” (テレビ漫画) or “TV manga”. There was “douga” (動画), which literally means “moving image.” All of these words referred to what we’d today call anime. But none of them really stuck. The word manga, of course, now refers to what would be called comic books or even graphic novels in English. In Japan, there’s a long, proud tradition of popular manga finding further success once animated. It wasn’t until the 1970s that the word “anime” first began catching on in Japan. It was also around that time that the otaku fandom as we know it today really started to come into its own. This is not a coincidence. By the 1980s, “anime” was widely used in Japan to refer to, well, anime. But, the word is also retroactively used to refer to works created and broadcasted before the term was in popular use. Take Astro Boy. The character and his look, with those giant eyes, were later used to help define the term anime, long after the show originally aired in the early 1960s. It’s no accident that Astro Boy’s creator, Osamu Tezuka, the man behind numerous highly influential and pioneering work, is known as “The Godfather of Anime.” His work brilliantly incorporated the American animation he saw and fell in love with as a child, most notably the animation of Walt Disney and Max Fleischer. It was the films of these two men that inspired Tezuka to make his own animation. But what’s often forgotten by modern audiences is just how large cartoon characters’ eyes were in the years prior to World War II. Here’s Fleischer with, perhaps, his most famous creation, Betty Boop. And Bimbo the dog, Boop’s pet, had even bigger eyes. “Anime” became a brilliant branding—a way to separate Japanese cartoons from cartoons in the rest of the world. (The other branding, Japanimation, has been used in both Japan and abroad, but as noted in The Anime Encyclopedia, the term evokes the wartime “Jap” slur.) Warranted or not, “anime” became a way to make the country’s cartoons appear different. When I use the word “anime” in English, you immediately know I’m referring to Japanese animation. This DVD says “Fun Anime World” (たのしいアニメワールド). And here is an “anime DVD” for Tom and Jerry. Even Disney is not immune to the word. Disney usually refers to its films as “Disney works” (ディズニー作品 or “Dizunii sakuhin”), but many fans call Disney movies “Disney anime” (ディズニーアニメ), with the word “Disney” typically appearing in front. Likewise, Japanese animation companies also refer to their own creations in a similar fashion. Above, you can see how Studio Ghibli also uses “work” (作品 or “sakuhin”), steering clear of the term “anime” or “animation,” even if fans do not. I’d argue that the word “anime” is loaded in English, too, which could explain why Studio Ghibli anime are often referred to as “Ghibli movies” or “Ghibli films” in English. It’s a way for English speakers to separate them from the baggage of anime. Not everyone does this, though. In the West, the word refers to Japanese cartoons—but it generally refers to a specific type of anime. 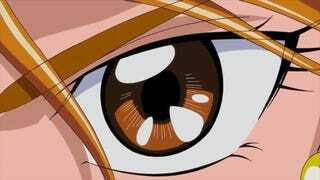 Namely, Japanese cartoons where the characters have giant eyes (anime eyes) and funky colored hair. The word “anime” is shorthand for this, and sometimes it can be used in a derisive fashion in English. “God, that’s SO anime.” Other times, it’s more neutral and simply being used in a descriptive manner. But is it always the right word? This is an animated character. Note the funny colored hair and big eyes. These are anime characters, right? Like many anime, there was first a manga version. And then, it was animated. Also, like many anime, this was shown on Animax, a network for anime. So... An exception you say! Maybe. This is Sazae-san. This is perhaps Japan’s most famous anime TV program. It’s been on television since 1969 and, literally, everyone in the entire country knows it. That cannot be said about other anime. The characters look rather normal. Nobody has enormous Astro Boy style eyes. That might be because this is based on a comic strip from the 1940s. But in the 1940s, American animation had some seriously huge eyes... And new episodes continue to be produced and aired on a weekly basis. This is America’s longest running program, The Simpsons. It features characters with funny-colored hair and huge eyes. As of posting, the first line of the Japanese Wiki very clearly refers to this show as an anime—though, an American anime. Most readers look at this and go, “Yep, that’s anime, alright.” Well, Japanese people would look at this and think the same thing. However, in Japanese, people will sometimes make refers to anime, saying something “looks like an anime” or “seems like an anime,” but not in a derogatory fashion. Rather, it’s descriptive and used to describe something that can be everything from over-the-top to idealized. (Note: This is also done with manga.) And the understood nuance is that they are referring to a scene or a style found in domestic animation. That’s both the beauty and the problem with the word anime. It has different meanings to different people. It’s shorthand. It’s loaded. Is there a way around that? Maybe, yeah. Qualifiers help explain what exactly you’re talking about. “Television anime.” “Disney anime.” “American anime.” Whatever. Do I think we should use another word than anime to describe a particular style of Japanese animation that many would immediately associate with the connotations that the word anime evoke? No. Not at all. The word is such a part of the English internet lexicon that an attempt to strike it from use would probably just cause confusion. Plus, language just doesn’t work like that.